Show you care - donate to the cause! Assistive technology is a device or service that helps children with disabilities participate more independently within their environment at home or school. The Simon Technology Center (STC) is dedicated to making the benefits of technology more accessible to children and adults with disabilities. Through a collaborated effort involving parents, professionals and consumers, the STC can provide numerous services for families, as well as resources and informative answers to questions. 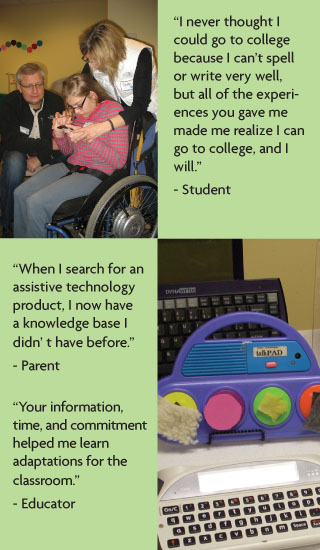 Since 1987, the STC has helped many children and adults with a variety of disabilities use assistive technology to enhance learning, work and independence. Make a donation of $10, $25, $100 or even more! Your contribution will help the STC continue its mission.